Features Two ad panels and striking trim. Actual Size: 3-3/4" x 13-1/4"
Standard Scale: °F only. °F & °C or °C only available. 5" tube. Item Colors: White (S), Yellow, Recycled Off-White. Packing: Individual gift cartons. 100 per cnt. 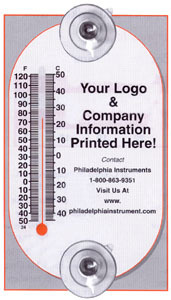 #260 Panorama Suction Cup Window Thermometer. Actual Size: 3-1/2" x 6-1/8"
1-15/16" x 3-5/8" (w/°F or °C comb scale). Standard Scales: °F only. °F & °C or °C only available. Item Colors: White (S), Clear. Packing: Individual gift cartons. 250 per cnt.